XVI International winter festival "Arts Square"
The XVI International winter festival "Arts Square" is devoted to the works of three anniversary composers: Pyotr Ilyich Tchaikovsky (175 anniversary since birth), Jean Sibelius (150 anniversary) and Georgy Vasilyevich Sviridov (100 anniversary). The considerable part of the festival poster is allocated for music of these masters. On December 13 on a scene of the Big hall the festival program the maestro Yury Temirkanov, the Chinese pianist Yudzha Wang and Zasluzhenny will open collective of Russia the academic symphonic orchestra of Philharmonic hall. In their execution will sound a masterly Second piano concert of Pyotr Ilyich Tchaikovsky (1880) and the Second Symphony of Jean Sibelius (1904). On December 14 in space of Church of the Resurrection (Church of the Savior on Blood) performed by a Chamber chorus of Smolny Cathedral fragments of the Liturgy of St. John Chrysostom of Tchaikovsky, "Chants and prayers" Sviridov, and also Balakirev, Mussorgsky, Lyadov, Chesnokov's spiritual compositions, Castalian will sound. On December 15 in the Big hall with a solo concert the winner of the IX International competition of P. I. Tchaikovsky, Boris Berezovsky will act. Performed by the pianist masterly piano transcriptions and original compositions of Liszt, and also the cycle "Seasons" of Tchaikovsky will sound. On December 16 in the Big hall winners of the XV Competition of P. I. Tchaikovsky – the Romanian cellist Andrey Ionitsa (the I award) and the Russian pianist Loukas Genyushas (the II award), and also, for the first time in St. Petersburg, the winner of the first award of the International competition of pianists in Leeds (2015) Anna Tsybulyova will act. Performed by musicians Variations on Tchaikovsky's rococo, the Second piano concert of Rachmaninov and the Second piano concert of Brahms will sound. On December 17 within "Arts Square" the Mikhaylovsky theatre will submit Pyotr Ilyich Tchaikovsky's ballet "Nutcracker" directed by Nacho Duato. On December 18 in the Big hall a concert of the British Vocal The Swingle Singers ensemble will take place. For the first time they will act together with the Academic symphonic orchestra of Philharmonic hall. On December 19 in the Big hall performed by Deserved collective of Russia under control of Nikolay Alekseev music of all three anniversary composers will sound. The program "Small triptych" of Sviridov will open. Then the winner of the IX International competition of Sibelius (2005) and the owner of a special prize for execution of its violin concert, the native of Leningrad, the German violinist Alina Pogostkina will execute a violin concert of the great Finnish composer. At the end of a concert the Sixth "Pathetic" symphony of Pyotr Ilyich Tchaikovsky, which premiere took place in a hall of Nobility assembly, nowadays Big hall of Philharmonic hall, on October 16, 1893 under control of the author will be heard. On December 20 in the Big hall a solo concert of a bass of Ildar Abdrazakov will take place. In a duet with the pianist Mziya Bakhturidze it will execute the program which included "Songs and dancings of death" Modest Mussorgsky, "Three sonnets of Petrarch" Franz Liszt, "Three songs of Don Quixote to Dulcinea" of Maurice Ravel, and also songs and Gabriel Faure, Mikhail Glinka and Pyotr Tchaikovsky's romances. In the same evening, at 19.00 in the Small Hall, performed by a Chamber Atrium quartet ensemble will sound the Third quarter of Tchaikovsky, the Seventh Shostakovich and the well-known c major Quintet of Schubert. On December 21 in the Big hall the debutante of last, XV "Arts Square", a soprano Olga Peretyatko will act. Together with the winner of the X International competition of P. I. Tchaikovsky, the pianist Alexander Gindin, she will execute recitatives and arias from Gioachino Rossini's operas, and also Tchaikovsky and Rachmaninov's romances. And in the Small Hall, this will be played at 19.00 by the British pianist, the winner of the VII International competition of P. I. Tchaikovsky, Peter Donokhou. In the program: Mozart, Ravel and Rachmaninov. On December 22, already in the Big hall, Peter Donokhou will step on the stage together with the Academic symphonic orchestra of philharmonic hall and Alexander Dmitriyev. In the program of the evening: The first symphony of Jean Sibelius, "The rhapsody on Paganini" Sergey Rachmaninov and "The Italian Capriccio" of Pyotr Tchaikovsky. On December 23 at the Small Hall the winner of the XIII International competition of P. I. Tchaikovsky of a mezzo-soprano Olesya Petrova and a bass Pyotr Migunov will execute vocal compositions of Georgy Vasilyevich Sviridov. In a concert nine songs on Alexander Blok's words and the vocal cycle "Songs of Robert Byorns's Words" will be heard. On December 24 within the Festival the St. Petersburg state theatre of the musical comedy "The Vienna blood" directed by the winner of the State award of Russia Igor Konyaev will submit Johann Strauss son's operetta. On December 25 the XVI Festival "Arts Square" will come to the end with a concert performance of the last opera of Pyotr Ilyich Tchaikovsky "Iolanthe". It will be presented by the international structure of soloists (French to a soprano the Liana Arutyunyan, the Czech tenor Pavel Chernokh and domestic singers: baritones Alexey Markov and Vladislav Sulimsky, basses Mikhail Kazakov and Fedor Kuznetsov, a soprano Zhanna Dombrovskaya and меццо Galina Sidorenko) accompanied by Deserved collective of Russia of the academic symphonic orchestra of Philharmonic hall and the Petersburg chamber chorus. 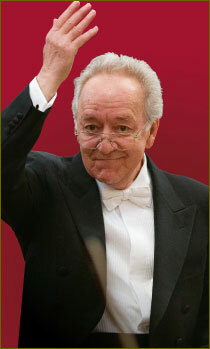 Behind the panel – the maestro Yury Temirkanov. Culture news archive for 04 December' 2015. Culture news archive for December' 2015. Culture news archive for 2015 year.